Mumbai Indians 3-141 (Dwayne Smith 63*, Kieron Pollard 31*, Sohail Tanvir 1-15) beat Lions 5-140 (Alviro Petersen 35*, Dwaine Pretorius 31*, Pragyan Ojha 2-26, Harbhajan Singh 1-19) by seven wickets. The bowlers of Mumbai Indians bowled well and Dwayne Smith laid a solid foundation with the bat as they clinched a fighting game against Lions at Jaipur. Lions scored 140 runs for the loss of five wickets in the measured 20 overs and Mumbai Indians achieved the target by smashing 141 with seven wickets in hand and 9 balls still available. 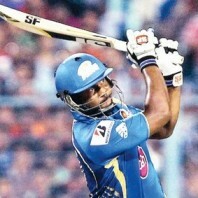 Dwayne Smith (Mumbai Indians) was declared ‘Player of the match’ for his unbeaten knock of 63 off just 47 deliveries. The 11th match of the Champions League Twenty20 in Group A was played on Friday, September 27, 2013, at Sawai Mansingh Stadium, Jaipur. Earlier, Rohit Sharma won the toss for Mumbai Indians and asked the rival team to bat first. Rassie van der Dussen along with Quinton de Kock opened the innings for Lions by scoring 25 runs in four overs with two boundaries each. The first was gone for 13 and de Kock followed him at 41 in 6.4 overs at his personal feat of 19. The middle order batting crumbled against the calculated bowling of Mumbai Indians and Lions were reeling at 5-81 in 13.2 overs. 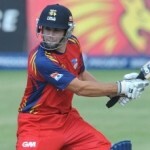 The skipper of Lions, Alviro Petersen, and Dwaine Pretorius controlled the situation with a thoughtful batting. The latter hit 2 sixes in the 16th over and Petersen got 2 fours in the 18th one. The batsmen accumulated 19 runs in the last two overs and took the score to 140 with half of their side back in the dressing room after the completion of the 20th over. Petersen secured his end for 35 off 27 with 1 six and 3 fours while Pretorius was at the other side at 31 off 21 comprising 2 sixes and 1 four. Pragyan Ojha was the top wicket taker with two whereas Mitchell Johnson, Rishi Dhawan and Harbhajan Singh shared one wicket each. The bleak form of the little master, Sachin Tendulkar, continued in the tournament when he was clean bowled by Sohail Tanvir for just five runs. Dinesh Karthik joined in with Dwayne Smith as the first hit 1 six and 1 four in the coming over. Smith dispatched two back to back sixes in the seventh over off Lonwabo Tsotsobe and Karthik was caught by Petersen at backward point for 13. Rohit Sharma walked in next and kept the score board moving with his senior partner. They added 11 runs in the 11th over with 2 fours and Smith hit another 2 fours in the next one. Sharma surrendered for 20 as the total touched 90 in 12.4 overs and he was replaced by Kieron Pollard who opened his account with a boundary. Dwayne Smith thrashed his 19th Twenty20 fifty in the 14th over as his team required 36 runs to win the game in the last 24 balls. Pollard collected 13 runs in the 17th over with 1 six and 1 four followed by 2 big sixes in the next one. The target was attained on the 4th delivery of the 19th over by plundering 141 runs with a wide. 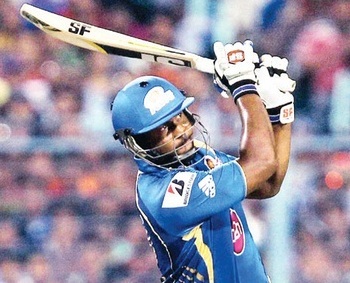 Dwayne Smith remained unbeaten for 63 off 47 with 3 lofty sixes and 4 fours whereas Kieron Pollard was batting at 31 from just 20 balls comprising 3 giant sixes and 2 fours. Sohail Tanvir, Imran Tahir and Dwaine Pretorius were the only successful bowlers with one wicket each. 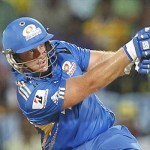 Mumbai Indians grabbed the encounter against Lions with a sufficient margin of seven wickets and held four points.